Follow the actual path of a space probe’s orbit (past, present and future) through the solar system in Starry Night® 5.7. Geoff Gaherty's guide to finding interesting objects in the sky if you don’t have (or don't want to use) computer assistance. Tricky targets this month: two planetary nebulas, three star clusters, and one of the sky's best double-stars. Submit your photos to SPACE.com for a chance to win a trip to Hawaii, a new Nokia 6682 and more! There are up to 10 new features in the NEW! Starry Night® 5.7 Update. As a thank you for all those who have purchased Starry Night® version 5, this 5.7 update (for version 5 users of Starry Night® Enthusiast, Pro or Pro Plus 5) with unprecedented new features and data is absolutely FREE! Click here for instructions on how to get your 5.7 update. 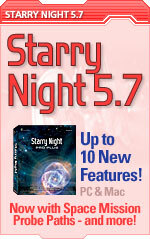 If you don't already own Starry Night® version 5, NOW is the best time to upgrade. Order before November 14 to receive savings on Starry Night® version 5 upgrade packs. Click here to find your discounted upgrade price. Order by November 14 to receive your discounted upgrade price! 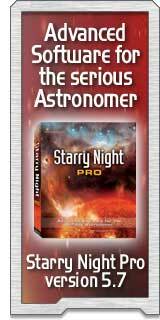 Please note you must already have a registered copy of Starry Night Enthusiast, Pro or Pro Plus version 5 in order to receive the FREE 5.7 update. Click here for instructions on how to get the new features and data in 5.7 update. *All prices are quoted in USD. Special upgrade prices for Starry Night version 5 upgrade packs expire November 14, 2005 11:59 pm EST. Not valid on previous purchases. Follow the actual path of a space probe's orbit through the solar system in Starry Night®. 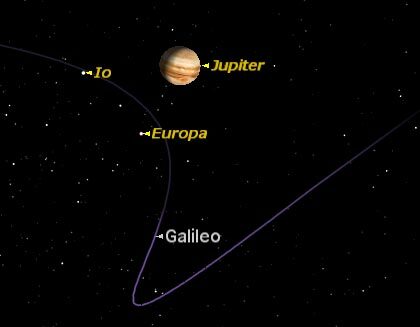 The space probe's past, current and future paths can be drawn onscreen. The best way to explore space missions is by taking a guided tour in SkyGuide. Open the SkyGuide Pane and click on either the "Guided Tours" or "Enter SkyGuide" link depending on which version of Starry Night you own. Then click on the "Space Missions" link to start the tour. 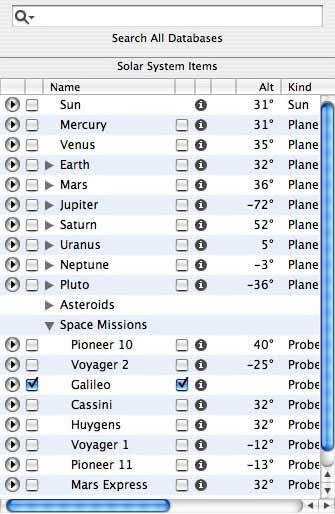 Space probes are listed in the Find Pane under Space Missions. The info (i) button listed beside each space probe provides you with a brief overview of the probe's mission. Check the box to the left of an object's name to label it. Check the box to the right of an object's name to turn on its orbital path line. To modify the appearance of a space probe's path, click on the Options Pane and expand the Solar System layer. 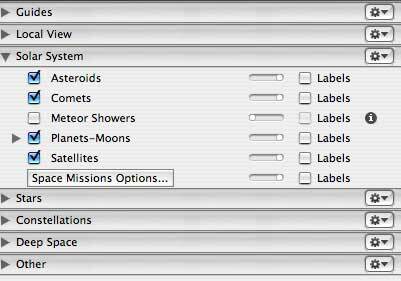 Then place your mouse cursor over the words "Space Missions"- the Space Missions Options button will come up - click on it. 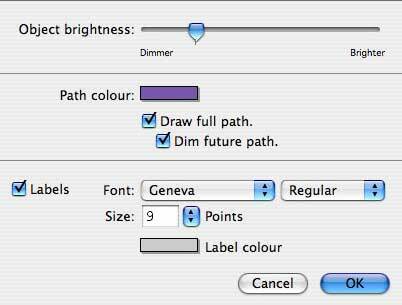 Path Colour: Allows you to select the color of the probe's orbit. Draw full path: Draws the past, current and future path of the object’s orbit. If left unchecked, only the past and current path is drawn. Dim future path: Dims the future path of the object's orbit. Note: Orbital paths are also depth queued, meaning that the further away a line segment is away from your "eye" the dimmer it will appear. In the August issue I wrote about exploring the sky using the Orion IntelliScope’s tour feature. But most telescopes aren’t equipped with computerized tours to guide the beginner through the sky. Here is a guide to finding interesting objects in the sky if you don’t have computer assistance. There’s difference between finding the location of an object and actually seeing it. Many of the objects we amateur astronomers look at are too faint to be seen with the naked eye. Some are too faint to be visible in our scope’s finder. Some may be so faint as to be a challenge to see in the main telescope. Seeing can be difficult. Finding an object, on the other hand, involves pointing the telescope at exactly the spot in the sky where the object is located. This can be done with a computer, or manually using a technique called starhopping. It’s not necessary to be able to see an object to point at it with the telescope. Many beginners make the mistake of looking for objects which are easy to find (because they are close to bright stars or familiar constellations) but which are very hard to see, because they are very faint. For example, many go hunting for the galaxy Messier 101 in Ursa Major because it is located close to two bright stars in the handle of the Big Dipper. Unfortunately, M101 is one of the most difficult objects in Messier’s catalog to see because it is large in size and very faint, so its dim light is spread over a large area. Unless you have very dark skies and a trained eye, you can be staring right at M101 and never see it! So it’s important, when you’re starting out, to go for objects which are both easy to find (located near bright stars or constellations) and also easy to see (bright clear objects, such as double stars and star clusters). Leave the dim galaxies (for the most part) until you have more experience. Starhopping involves pointing your telescope using known guideposts in the sky: bright stars and constellations. This in turn requires some familiarity with the stars and their grouping. When you first look up into a starry sky, especially from a dark rural site, the view can be overwhelming. You wonder, “How will I ever be able to make sense of all these stars?” Learning your way around the starry sky is very much like learning your way around an unfamiliar city. It helps to have a map. It helps to have a familiar landmark or two to get your bearings. And it also helps to have a friend to show you the way. For a map, you have software programs like Starry Night® which will give you an overview of the territory. You may know a few “landmarks” in the sky to get you going, such as the Big Dipper, Orion, a bright planet, or the Moon. An astronomical friend is also very helpful in the early stages, someone who knows the stars a bit better than you do and can point out some landmarks. You may know such a person already, or you may need to find one by joining a local astronomy club. Although I’m not out there under the stars with you, I hope some of my suggestions here will also help you get started. The first step is to print out a chart or two to take outside with you. Many of the charts you find in books or magazines are less than helpful for two reasons: they try to show all the sky, and they show it on too small a scale. I prefer to use charts which show only part of the sky, but which are on a large enough scale to approximate the actual spacing of the stars across the sky. Go out with this chart and face east. The top of the chart is overhead, the bottom is the horizon. The most obvious object in the eastern sky is Mars, glowing brightly about a third of the way from horizon to overhead. But our targets for tonight are farther away. As I said earlier, the Big Dipper is a poor starting place for deep sky hunting because it lacks bright objects. 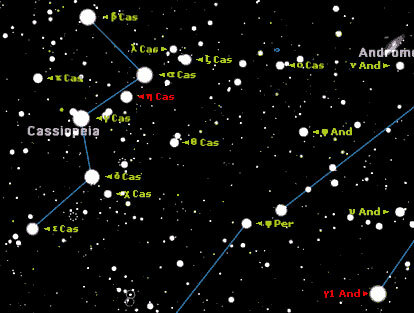 Let’s look instead at Cassiopeia, a constellation which lies almost directly opposite the Big Dipper in the northern sky. In this chart, it's about two thirds of the way from horizon to zenith, an obvious lopsided W shape, visible even under city skies. 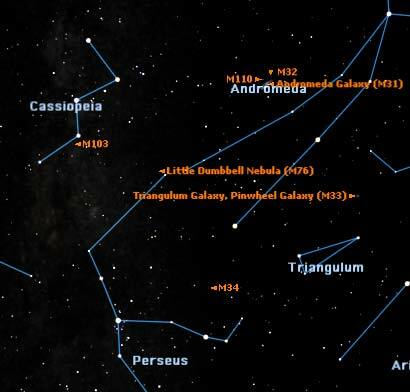 Once you’ve identified Cassiopeia, you have some landmarks which will let you point your telescope at a variety of interesting objects. Besides your star chart, you will need a red flashlight to read it. 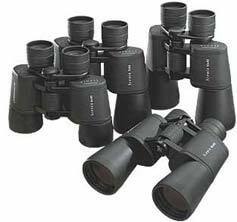 You will also find it very helpful to have a pair of binoculars with a field of view similar to that of the finder scope on your telescope. I find 10x50 binoculars particularly useful for this. Binoculars let you practise the “hop” in a more natural way than the view through the telescope’s finder, which is usually upside down. After I’ve tried a “hop” a few times with binoculars, I’m ready to repeat it with the telescope finder. Let’s start by tracking down a couple of double stars. Many beginners are unaware that many of the stars which appear single to our naked eyes are double or multiple in a telescope. They are great targets for beginners because they are easy to see as well as easy to locate. The five bright stars in Cassiopeia which mark the W are named, from top to bottom in this view: Beta β, Alpha α, Gamma γ, Delta δ, and Epsilon ε. We can find our first double star, Eta η Cassiopeiae, by looking a little less than half way between stars Alpha α and Gamma γ. You can see it there in the chart below, marked by the Greek letter Eta η. 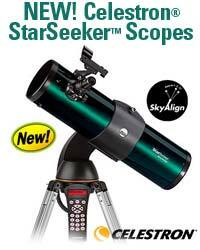 Place the crosshairs in the finder of your telescope on that star, and when you look through the telescope you will see it is actually two stars: a bright yellow one and a fainter red one. The second double star is a bit farther afield, but illustrates the principles of starhopping. Look at the two top stars of the W, Beta β and Alpha α. Use the distance between these two stars as your “measuring stick.” Extend the line from Beta to Alpha by two stick lengths to the lower right, which will take you to the star 51 Andromedae. Continue in the same direction about half the distance again, and you will reach a brighter star, Gamma γ Andromedae. This is our target: in the telescope it will appear as a double star, the two stars a bit closer than Eta η Cassiopeiae, and this time colored gold and blue. Now let's go after some deeper targets, some of the beautiful star clusters located in or near Cassiopeia. First take a close look at Delta δ Cassiopeia (second from the bottom in the W). In binoculars you will see a fairly bright star below and to the right of it, Chi χ Cassiopeiae. Use the line between Delta and Chi as the base of an equilateral triangle hanging below them, and put the crosshairs of the finder on the lower angle of this triangle. Through the telescope’s eyepiece you will see a compact little star cluster, number 103 in Messier’s catalog. Imagine a tall thin isosceles triangle on the opposite side of the same baseline, put your crosshairs there, and through the telescope you will see the star cluster NGC 457. It has two bright stars in it which many people see as eyes. Traditionally those are the eyes of an owl, the rest of the cluster forming the erect body of the owl with wings outstretched. But to our modern eyes, it looks rather like the character E.T. in the famous movie. So this cluster is called by some the Owl Cluster and by others the E.T. Cluster! Let’s go hunting farther away. This time use the line joining Gamma and Delta Cassiopeia as your measuring stick and pointer. Go twice its length downward towards the horizon and you should see a fuzzy patch through your binoculars and finder. Through the telescope you will see the Double Cluster in Perseus, one of the wonders of the night sky in any telescope. If you keep going in the same direction towards the horizon you will encounter a line of three bright stars, the last of which is at the center of a little known star cluster, Melotte 20. The trouble with this cluster is that it is so close to us that its stars are spread wide across the sky, too wide to fit in most telescopes, so that they can only be viewed with binoculars or the naked eye. This is one of the star clusters closest to our Sun, also called the Alpha Persei Moving Cluster because the star Alpha α Persei is at its center, and all the stars share a common proper motion across the sky. Now that you’ve become better trained in starhopping, I’m going to end by giving you a special treat. I said earlier that most galaxies are difficult for beginners to see, but one exception is the Andromeda Galaxy, quite close to Cassiopeia. Here’s how to find it. Look closely at the top three stars of Cassiopeia, Beta, Alpha, and Gamma. If you look closely, you’ll see that there’s a fourth star, Kappa κ Cassiopeiae forming a rather lopsided square with the three brighter stars. Use the line from Kappa to Alpha as your measuring stick, and follow the line from Kappa to Alpha two and a half lengths to the right. Through binoculars and your finder you should see a faint fuzzy patch. Through the telescope you will see a much larger fuzzy patch. Don’t expect to see its spiral arms or much else (unless you have very dark skies and a large telescope), but be aware that the light you are seeing is coming from more than two million light years away—that’s part of the magic of astronomy! The Saturn Nebula (NGC 7009) is an oval Mag 8 fuzzy patch hanging in space about 4,000 lightyears distant. Medium-sized scopes show a ring with "knobs" on either side. M72, close by, is a small remote globular cluster, difficult to resolve. The open cluster M73 is a tiny triangular collection of stars, barely noticeable. 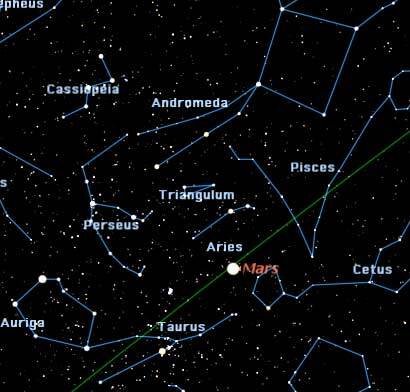 However, the same field of view contains a lovely Lyra-like asterism. The Mag 7 globular cluster M2 is about 40,000 lightyears away. Although among the brightest of globs in the sky, M2's core is so concentrated that, as an observational object, it ranks as one of the less compelling. The Helix Nebula (C63/NGC 7293) is a tricky target. Although it is the largest visible planetary in the night sky (about half the apparent diameter of the full moon) it's quite dim. Dark skies are a must. A low power eyepiece in your telescope, with averted vision, may give you some hint of structure. Finally, 103 lightyears distant is one of the sky's finest doubles, Zeta Aquarius. Watch interplanetary space probes as they visit the planets and moons of our solar system in this 2 1/2 minute video clip created with Starry Night® version 5.7. Download the 5.7 update if you're already a 5.x user or upgrade if you own version 4.x or earlier, and create your own space movies! Trouble viewing? You'll need QuickTime 7 to view this movie. If your mouse has a scrolling wheel, Starry Night® 5.x supports it. You can use the mouse wheel in the main sky window to zoom in to an object or zoom back out. You can also use the mouse wheel to change the Date and Time in the Toolbar. Simply click on the date or time display and then use the mouse wheel to scroll through time. For example, click on the current month in the Toolbar to highlight it. Then scroll the mouse wheel forward to move forward a month, or scroll backwards to move back a month. Mouse wheel support for navigation is just one of the many ways Starry Night® makes its interface intuitive and easy to use. Starry Night® is a division of Imaginova Corp, formerly Space Holdings. Submit photos to SPACE.com for a chance to win a trip to Hawaii, a new Nokia 6682 and more! Sponsored by Nokia and Imaginova. Have you been taking pictures with your new digital camera? Your albums of science and space images could be your winning ticket to a trip to Hawaii. Nokia and SPACE.com are looking for your best astronomical and science photography. Submit your cool images to Amazing Images and, if your entry is voted one of the best, you can qualify to win amazing prizes. Don't forget to tell your friends. The more times (and more friends) who vote, the more chances you have to win!